Evidence-based Paediatric and Adolescent Diabetes brings together an international group of paediatric diabetes specialists to address the cause, course and complications of all types of diabetes. From a careful review of the latest research, they propose the best possible evidence-based recommendations for the care of children and the youth with diabetes. 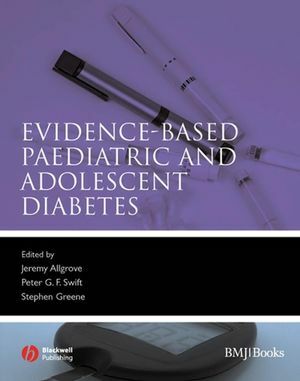 As the incidence of type 1 diabetes mellitus continues to increase worldwide, and type 2 is being seen in more young people, this timely volume will help a wide range of health care professionals deliver the best possible care to their young patients. Jeremy Allgrove is Consultant Paediatric Endocrinologist, St Bartholomew's Hospital and Newham General Hospital. He is the representative of The Royal College of Paediatrics and Child Health (RCPCH) on the Diabetes Dataset Advisory Group (England). Dr Peter Swift is Consultant Paediatrician (diabetes and endocrinology) at the Leicester Royal Infirmary Children’s Hospital, UK. He has been Editor-in-Chief of the International Society for Pediatric and Adolescent Diabetes (ISPAD) Consensus Guidelines since 1996. Dr Stephen Greene is Consultant Paediatrician, Ninewells Hospital, Dundee and Chairman of the SIGN (Scottish Intercollegiate Guidelines Network) on Diabetes in Children and Young Adults. SIGN guidelines are recognised as leading publications in evidence-based management. Over the last 12 years Stephen Greene's group has developed an international reputation in research in various areas of chronic disease in childhood and adolescence, particularly Type 1 diabetes, and childhood growth. 1 Methodology of evidence-based medicine. Jeremy Allgrove (Royal London Hospital). 2 Definition, epidemiology and classification of diabetes and structure. Maria Craig (Institute of Endocrinology & Diabetes), Sarah J. Glastras (Institute of Endocrinology and Diabetes) & Kim Donaghue (The Children's Hospital at Westmead). 3 Aetiology of type 1 diabetes mellitus – genetics, autoimmunity. Loredana Marcovecchio (University of Cambridge), David B. Dunger (University of Cambridge),. Mark Peakman (King's College London) & Keith W. Taylor (Barts and the London). 4 Type 1 diabetes mellitus – management. Joanne J. Spinks (John Radcliffe Hospital), Julie A. Edge (John Radcliffe Hospital), Krystyna Matyka (Clinical Sciences Research Institute) & Shital Malik (Paediatric Specialist Registrar). 5 Type 1 diabetes mellitus in the very young child. Stuart Brink (Tufts University School of Medicine). 6 Adolescence and diabetes: clinical and social science perspectives. Alexandra Greene (University of Aberdeen) & Stephen Greene (Maternal and Child Health Sciences). 7 Management of special situations in diabetes. Fergus J. Cameron (Department of Endocrinology and Diabetes) & Jeremy Allgrove (Royal London Hospital). 8 Dietary management: optimising diabetes outcomes. Sheridan Waldron (Leicestershire Nutrition and Dietetic Service). 9 Education in childhood diabetes. Peter G.F. Swift (Leicester Royal Infirmary). 10 Psychological interventions in childhood diabetes. John W. Gregory (Cardiff University) & Sue Channon (Consultant Clinical Psychologist). 11 Screening for associated conditions and prevention of complications. Catherine Peters (SpR Paediatric Endocrinology) & Jeremy Allgrove (Royal London Hospital). 12 Type 2 diabetes mellitus – genetics, diagnosis and management. John Porter (Birmingham Children’s Hospital) & Timothy G. Barrett (Institute of Child Health). 13 Rare forms of diabetes. Julian Shield (University of Bristol), Maciej T. Malecki (Jagiellonian University), Nicola A. Bridges (Chelsea and Westminster Hospital) & Jeremy Allgrove (Royal London Hospital). 14 Diabetes and information technology. Kenneth J. Robertson (Royal Hospital for Sick Children).